Tyron Woodley says he’ll fight his rival Colby Covington next if asked, but the welterweight champ also believes “Chaos” blew his chance, by not facing him last night. Covington was initially approached to fight Woodley last nigh at UFC 228, but he passed on the bout, citing nasal surgery he had to undergo. Woodley ended up facing Till, and in Saturday’s headliner, he tapped the rising star out with a second D’Arce choke. 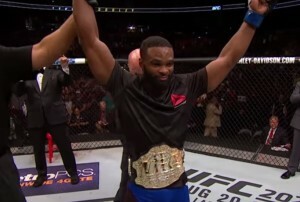 “I’m not saying I am going to fight him, because I don’t feel he deserves my platform right now,” Woodley said. “He had the chance to be here. He bitched out, if you want to be honest. He talked all that crap, and then he got in the hot seat. “Is it the dude that needs the Clariton? The Zyrtec? My god. This guy had a chance. He let Darren Till go out there and take his whooping for him. He tried to pause and tried to wait until a bigger pay-per-view, because his eyes got big. Woodley has now defended the welterweight title four times, since he won it in 2016 by stopping Robbie Lawler.